Fourth- and fifth- grade students from two schools in the same rural community were tested on multiplication, division and basic math facts. After 10 weeks, students were tested again. Students who had played our games an average of 30 minutes, twice a week, improved their math scores 50%. The control group school students improved their scores 10% . 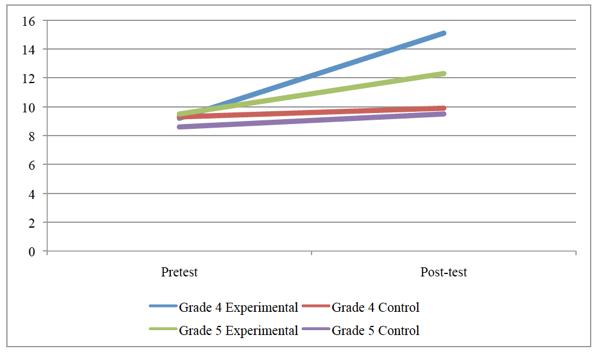 Students in classes that played the games less often (the fifth-graders) improved less than 50% but still more than the control group. These scores improved 50% – why does your marketing say “over 30%” ? We have since replicated these results with larger samples, in different communities and with our games for older students. Not every school showed the dramatic improvement of our pilot study, but the average improvement is around 30% and significantly higher than control groups. The full text of three papers is below.